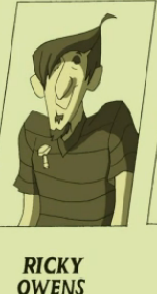 Currently missing, Brad Chiles is registered as the leader of the original Mystery, Inc! 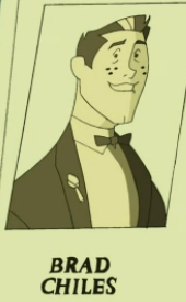 Good looking and in relationship with Judy, before missing in the caves, he (or Judy) must have left a locker of him and her in a picture. Fred, when revealing The Freak,which turns out to be his fake father, finds out that his real father is Brad and that he had to leave him or his family would get hurt on the opposite! Fred Jones went into a search for his lost parents as he's hoping to find them not far away and alive! Remaining missing, another old member of the original Mystery, Inc and mother of Fred Jones, who also had to leave because of fear for loss of her family. 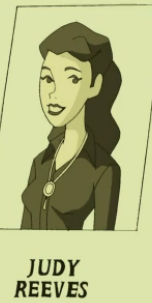 An old version of Daphne, she must be, as she also kept the locker with a picture of her and Brad, her husband (or just boyfriend)! Fred is looking for her, as much he is for his father! A version of Velma in the original Mystery, Inc, but not the brain of the gang too. In love with Ricky with big romantic plans, after the curse of Crystal Cove, she had to leave the town! Her former lover, now known as Mr. E brought her back in Crystal as she keeps the gang safe as Angel Dynamite, a Radio DJ! An version of Shaggy, but in the old Mystery, Inc, he was the best friend of their mascot, professor Pericles! He used to be a in a relation ship with Cassidy Willains, who now protends as a DJ on a radio and close friend to the new gang. He goes off protending like Mr. E in the present as he teams up with Cassidy and goes after their old mascot and sends clues to the new gang of solving this big mystery!